In its heyday of the first half of the seventeenth century, a broadside ballad was a single large sheet of paper printed on one side (hence “broad-side”) with multiple eye-catching illustrations, a popular tune title, and an alluring poem—the latter mostly in black-letter, or what we today call “gothic,” type. EBBA's goal is to make these ballads fully accessible as texts, art, music, and cultural records of the period. About 11,000 English broadside ballads of the entire seventeenth century survive. 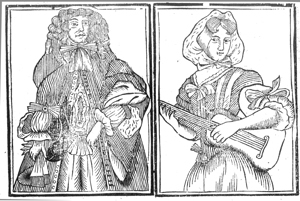 To capture the genre’s arc of development, EBBA seeks to archive all these printed ballads—with priority given to the black-letter ornamental broadside of the genre’s heyday—as well as all surviving sixteenth-century broadside ballads (about 250) and a representative sampling of broadside ballads of the early eighteenth century. We provide high-quality ballad sheet facsimiles of all ballads as well as facsimile transcriptions (which preserve the ballad’s original ornament while transcribing its unfamiliar typeface into easily readable modern print). In addition, we supply recordings of the ballads whenever a tune is extant, extensive cataloguing of the ballads, including cataloguing of their illustrations or woodcut impressions, TEI/XML and MARC records, and advanced search functions that allow readers easily to find collections or individual ballads as well as their constituent parts or makers by a variety of means. We also offer background essays on the various ballad collections included in EBBA and on ballad culture generally as well as other helpful ballad resources. For more about the EBBA project, see About Us.